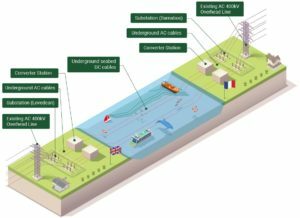 AQUIND Interconnector is comprised of three principal elements, being the onshore elements in Great Britain, the marine elements between the UK and French coastlines and the onshore elements in France. Two pairs of direct current (‘DC’) cables with one fibre optic cable of smaller diameter per pair of cables for data transmission from the proposed landfall site in Eastney (near Portsmouth) to the converter station at Lovedean. The cables will be approximately 20 km in length and the intention is to locate the cables within existing highway or road verges where practicable. Two pairs of underground high voltage direct current cables together with smaller diameter fibre optic cables for data transmission (one for each pair of electric cables) from the landfall on the French shore to the newly built converter station near Barnabos substation, approximately 35 km in length. It is proposed that the landfall site in France will be near Dieppe or Pourville-sur-Mer, with the exact location to be confirmed subject to further environmental and technical assessments. – Approximately 29 km within the French territorial limit, i.e. 12 nautical miles from the mean high water mark.